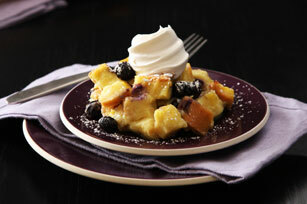 This wonderfully comforting bread pudding is studded with juicy blueberries. Beat pudding mix and milk in large bowl with whisk 2 min. Whisk in sugar and eggs until blended. Add bread; stir to evenly coat. Gently stir in blueberries. Spoon into 9-inch baking dish sprayed with cooking spray. Bake 40 min. or until centre is set and top is golden brown. Sprinkle with icing sugar just before serving with Cool Whip. Prepare using 2 cups frozen raspberries.